The Cincinnati Reds closed out the series against the San Francisco Giants this afternoon by failing to sweep the Giants to the tune of 6-5. 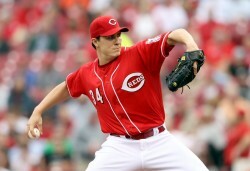 Homer Bailey started for Cincinnati and turned in 6.1 innings of solid performance. He allowed 3 runs (2 earned) on 7 hits and 2 walks. On the other side of the plate, Bailey also got his first hit of the season and brought in a run. Gotta love a pitcher helping himself. Logan Ondrusek relieved Bailey and continued his scoreless season. In 1.2 innings of relief, Ondrusek allowed 0 runs on 0 hits and 0 walks. He even struck out 2. Sweet. Sean Marshall pitched the ninth, and wasn’t maybe quite as poetic as Ondrusek in the way he went about his business. In his 1 inning of service, Marshall put a couple guys on base before striking out Ryan Theriot for the first out of the inning. Then, Angel Pagan’s home run happened, and the Giants took a 6-5 lead. Fortunately for Marshall, Pablo Sandoval lined out and Melky Cabrera got himself picked off first or else who knows what kind of hurt Buster Posey might have put on his ERA. There was some good news on the offense. The best of which being Scott Rolen hitting a home run in his second consecutive game. This time it was a pinch hit homer in the seventh. It may be a little early still to declare Rolen’s slow start over and move him back to clean-up, but at least he seems to have found his late-inning stroke. Jay Bruce also hit a home run (with a man on, even), but that’s hardly news. Young Bruce is turning into quite the slugger. His 3-for-4 day is noteworthy, though. On the bad side, Joey Votto added another three strikeouts to his prodigious strike-out total. With no walks this game, his Ks are starting to pull away from his BBs in the tally chart. The loss brings the Reds’ record to 9-10, ending that brief flirtation with above-.500 baseball. The Reds haven’t won more than they’ve lost since April 8. Tomorrow they host the 7-12 Houston Astros at 7:10 p.m. Mike Leake takes on the dreaded Wandy Rodriguez. Posted in Cincinnati Reds, Game Wrap.